Oh my goodness, this is going to be another crazy, busy week for me. I swear, one day I want a normal week where I don’t feel like I am a chicken running around with my head cut off. I just get so overwhelmed with the amount of stuff I have to do. Anyway, enough griping… not like I have time for it – LOL! I love the homemaker accountability group on Facebook to help me stay on track with all the things I need to do. Anyway, since I have so much to do this week and even more next week, I am doubling up on some meals to create some freezer friendly goodness to help me! 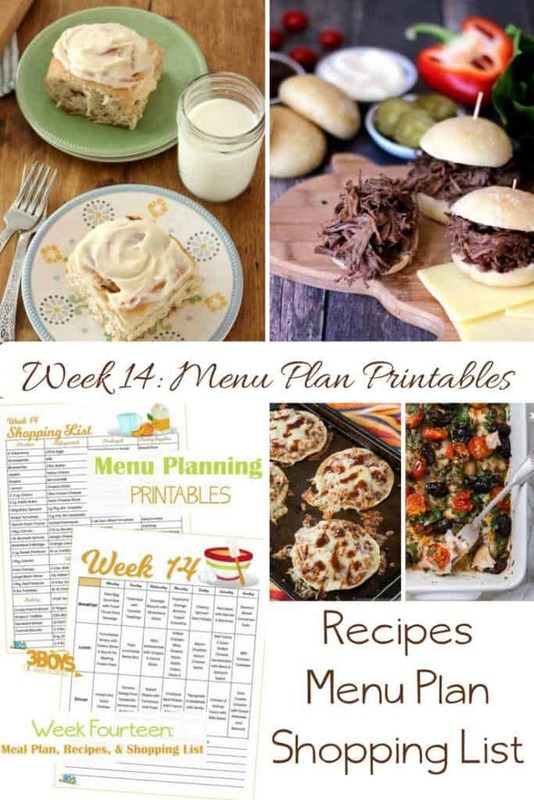 Scroll to the bottom to print out these plans and the shopping list or, if you don’t want to wait, you can get 5 weeks of menu plans and shopping lists here. 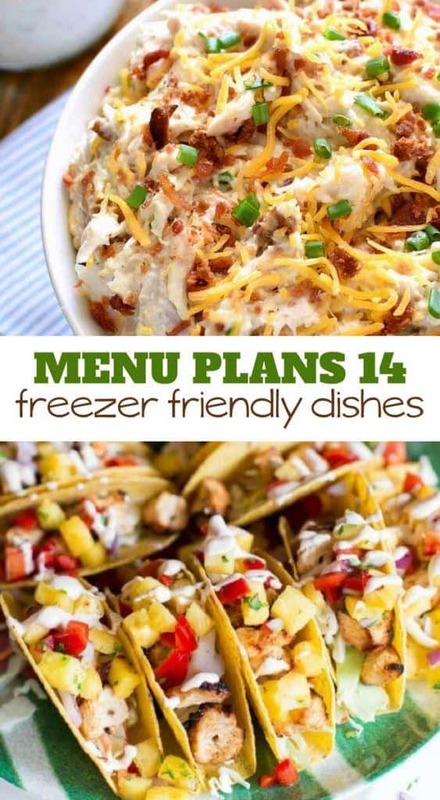 I designed this week to be the largest purchase, and included freezer meals which can be used later in the month. Monday- Easy Egg Scramble, simply cook 1/2 lb. crumbled bulk sausage, whisk some eggs together into the cooked sausage pan, when eggs are nearly done, sprinkle on some shredded cheddar or colby jack cheese and let it melt. Serve with toast. *While cooking the sausage, fry up a few extra patties from the other 1/2 lb. for Wednesday’s breakfast, remove from pan before adding eggs and store in fridge. Wednesday- Sausage Biscuits, bake up some canned biscuits and use pre-cooked sausage patties from Monday for a quick and easy breakfast. Add in some fresh cut strawberries for a little something healthy & sweet. (At the end of the week, peel, half, and freeze any leftover bananas). Monday- Tuna Salad Wraps with Celery Sticks, and ranch dipper. Add some frozen peas as well, they’ll be perfect cold for lunch. Add a fun treat like teddy grahams or rice krispy treat. Thursday – Cooked, Grilled Chicken Bites, with cheese stick, apple, celery sticks and goldfish crackers. Tuesday- Tomato Asiago Pork Tenderloin at My Life Cookbook serve over buttered noodles with a side of steamed peas. Thursday –Crockpot Beef Sliders at Real Life at Home top with your favorite sandwich fixings. Fry up some french fries and serve with a fruit salad. 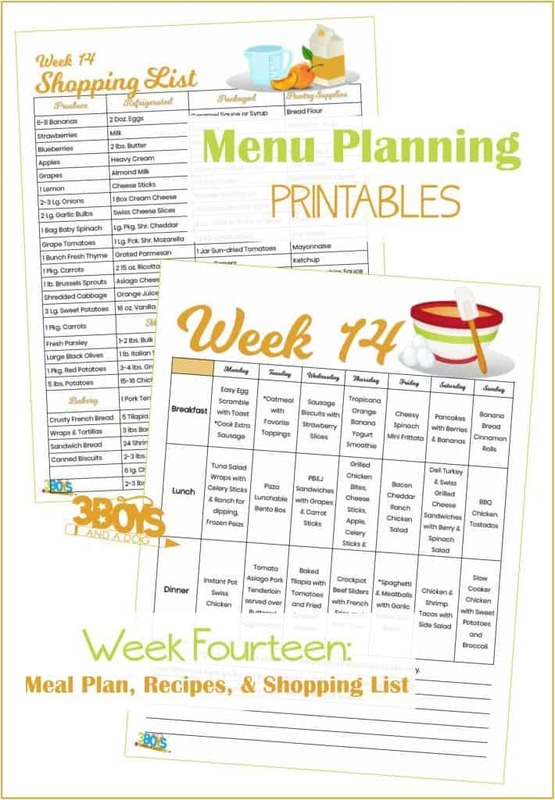 Friday – Spaghetti & Meatballs with Garlic Bread and Salad (Reserve leftovers for lunch on Wednesday of week 15). Saturday – Chicken & Shrimp Tacos at Spaceships & Laser Beams served with a side salad. 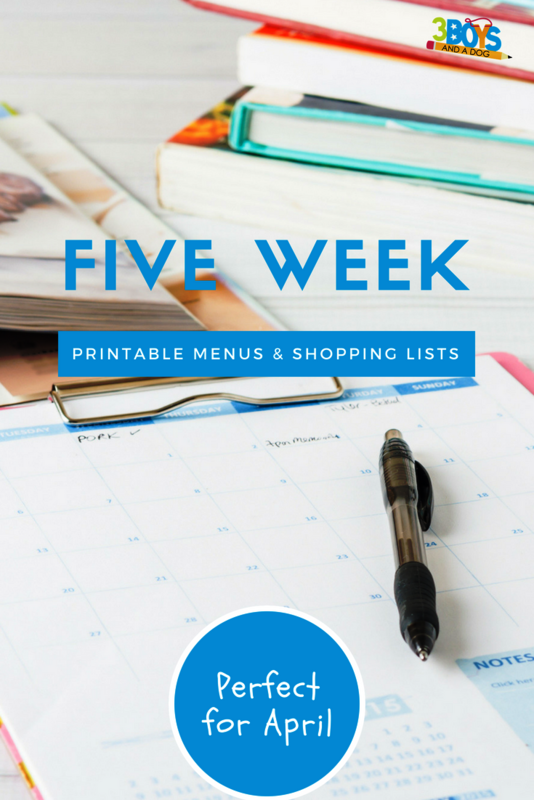 OR get 5 weeks of planning and shopping printables in my shop.